To update our previous post which looked forward to the Fun Palaces weekend, I thought I’d find out how it went. Unfortunately no libraries near me were participating this year - although I had fun in Medway’s Nucleus Arts centre learning about a scientific instrument that is going on a rocket to Mercury, watching a teabag rocket, and stress testing a truss bridge made by an 8 year old - which withstood all the weight we could find to load onto it! So I turned to the Innovators Network and Twitter to find out from library colleagues what they had been doing. Thank you to everyone who responded - I hope the post that follows captures the flavours and diversity of activities that went on in libraries around the country. Everyone an artist, everyone a scientist! Andy Wright got in touch to tell me that over 60 people attended the Fun Palace in South Elmsall library, that brought together people of all ages and abilities. The community were asked what skills they could share and the skills they would like to learn, and then these were delivered by local people to local people. Knitting, card making, cross stitch, surfing the internet, IT, gardening, poetry, planting and even making homemade paper were all featured. Feedback received from some of the makers and participants included: “ I’ve met a young girl today who I’ve never spoken to before and she lives on my street. 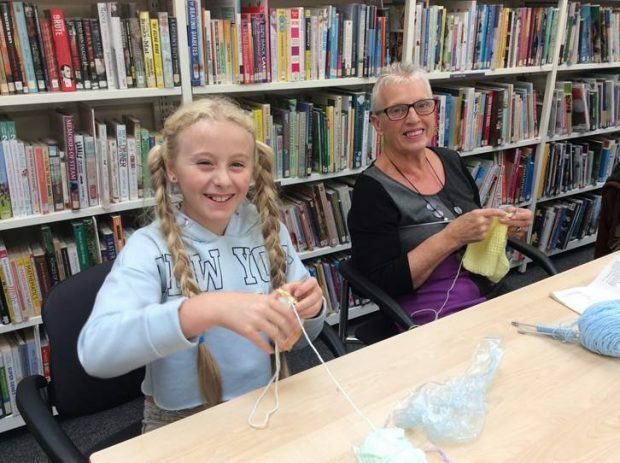 Through chatting I’ve found out her Grandma was my best friend at school”….. “This is great, I’ve wanted to learn to crochet for years and never got around to it”…”Nice to see young people wanting to learn these things”. The Fun Palace created a fabulous morning of intergenerational community spirit. In 2014, the library team was approached by a small group of local community enthusiasts who'd read about Fun Palaces online and loved the idea of creating a free, friendly, fun DIY Art and Science festival in Lancaster. They had almost no funding, so in the first year everyone begged, borrowed and schmoozed wildly with every conceivable local artist and scientist we could find and they all amazingly gave their time, knowledge and expertise for free. It was a fantastic two days full of unexpected gems. 2015 and 2016 have seen more local partners joining the organising committee which now consists of people from theatre directors, actors, graphic designers, local artists, members of the Friends of the Library and library staff. Everyone gives their time for free and works throughout the weekend coordinating, organising and ensuring the success of the festival. They are getting better at fundraising and have had amazing support from our County Councillors which has allowed them to think even bigger. The team from Lancaster library shares lots more details of what they did this year in their report. Norfolk and Norwich Millennium Library became a Fun Palace for the first time on 1 - 2 October this year giving us a fantastic and exciting opportunity to reach out to people from a wide section of the community we serve to engage with arts and sciences. Over the course of two days, we brought together artists and scientists (and artistic scientists and scientific artists) to deliver a wide range of activities to the local community from night sky photography to story-telling in Spanish, an intergenerational story-telling session giving grandparents the chance to share their memories for grandchildren to perform through actions, dance or song and African crafts. In all, we worked with 13 different people from seven different organisations to deliver activities. About 50% of people who took part in the activities hadn’t been to an event at the library before and nearly all of the people coming along hadn’t heard of Fun Palaces before. The feedback was incredibly positive and, having dipped our toes in the water this year, we will be aiming to take part in the Fun Palaces weekend in 2017 with an even bigger and better event! We prepared a ‘Storify’ of our weekend plus we had a great deal of positive interaction through ‘likes’ and ‘retweets. 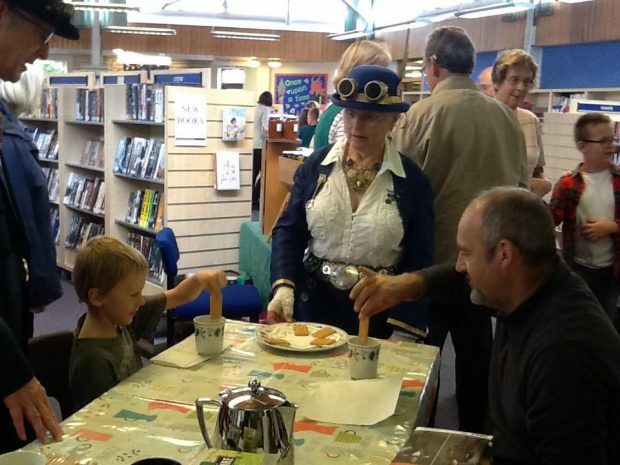 At Hampshire Library Service, we held our first Fun Palaces at Yateley Library and Stubbington Library this year. More than 1,200 people came to celebrate with us, learning new skills such as crocheting, enjoying choir performances, and taking part in some furious steampunk tea duelling! 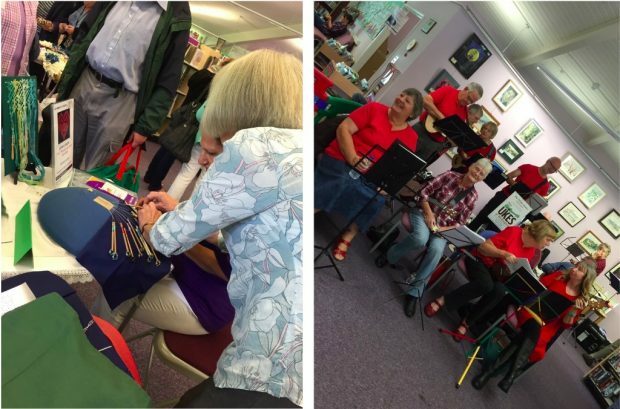 Guests at Yateley Library had a chance to try out Virtual Reality headsets, taking trips to the moon and making friends with dinosaurs, whilst at Stubbington, visitors were serenaded by ukuleles. Sarah Davis led 2 sessions in Blackheath library. 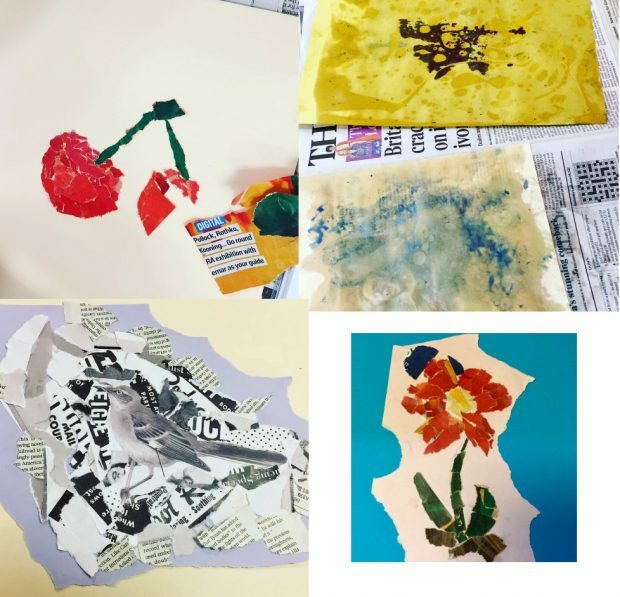 One explored the science of water density by making marbled paper using water, cooking oil and food colouring, the second was a creative session making colourful collages using recycled paper. Both activities were for all ages and all participants enjoyed them. Each was designed and led by the teams at the libraries and were all different. Wells library ran a hugely popular Voyage of Space Exploration including lunar adventure activities for all ages, with hands-on experiments with the Space Detectives, the chance to try out the solar telescope and the Star Trek transporter, plus 3D printing of rockets and Tim Peake's space ratchet. Visitor numbers were double those of a standard Saturday and all had a fantastic time. Photos are on their facebook pages. Bridgwater library's Fun Palace included Bridge Building with EDF, Internet safety for families with O2 Guru, art and craft activities and an investigation on sound and hearing. And take a look at this Cornish Crafty Girls photo compilation. Taunton library held a day full of hands-on digital, electronics and robotics - 3D printing Pokemon keyrings, robotics city, Lego Mindstorms building, minecraft , plus games with the Pauline Quirke Academy of Performing Arts and crafting with Somerset and Bristol Branch Butterfly Conservation. The event attracted a range of people, but there was noticeable participation by eight to 16 year old boys who wanted to stay and play for the whole day! People actively participated in arts and sciences in the centre of their communities; feedback was brilliant, the teams felt great about what they'd achieved, new partnerships were formed and, as an added bonus, visitor numbers were significantly up! And how did it go in the late entry: Yatton? To quote one of the library staff “phew, it was a success”. Visitor numbers doubled with over 200 people coming along to the village library Fun Palace event in just three hours. Frances Tout’s blog post (linked above) contains lots of photos which illustrate the range of activities they packed in - even more impressive when you hear that the whole event was organised in just 2 weeks. Do Fun Palaces meet the goals originally set? Mary: "When we spoke about Fun Palaces in 2012, you said that brand new things would come out of it - things that you hadn’t even guessed at. What have those been?" Stella: "This year, my guess is about 40% of Fun Palaces are happening in libraries. And I'm not surprised about that. I think they’re ideal places because, in most libraries, the public already has a bit of a sense of ownership I think. Libraries have really taken to Fun Palaces. Partly because they’ve had to. Cuts mean they need to look at what they can do that is more of an assets based approach - what have we got, rather than what can we buy in. Partly, I think because of that, and this is not condoning the cuts in any way, this has made them look to their local communities more, perhaps. Which is fantastic because one of the things we’ve always said is that we’re not saying that what people are doing in Fun Palaces is new to where they live, what we’re saying is quite often it doesn’t have a light shone on it. And quite often there are amazing things going on in all communities that because of our narrow view of what culture is - you know high art, ballet, opera, the canon in terms of theatre, that kind of stuff - we’re not calling what happens in local communities culture but of course it is culture and it’s certainly culture to those who practise it. So libraries I think have understood brilliantly that this is a way for them to open their doors a bit more, to build on what they already have, and in some ways to really push themselves. Because, like anywhere, depending on the venue or the people who run it, they too can be a little bound by convention. So the fact that we say really mix it up, really try to open up your public space, I think they’ve taken to it really well. So we didn’t know that was coming!" I’ve received so many reports of this years Fun Palace activities in libraries, I’ve decided to split the post - chapter 2 will follow very soon. Here in Manchester and Greater Manchester we're still talking about Fun Palaces. A handy hint is to get local councillors involved and encourage volunteers from the wider council you'd be amazed the talent that is in your own organisation.